House Republicans released their new "Better Off Now" message ahead of the 2018 midterm elections. 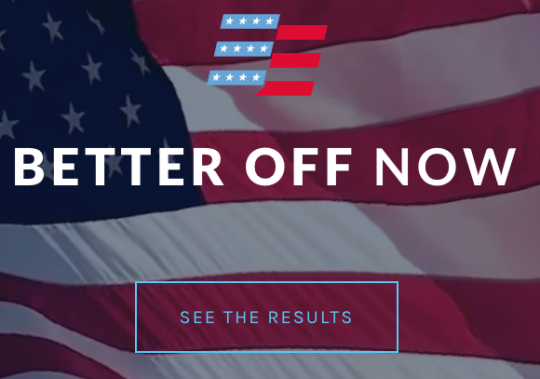 The campaign, accompanied with a social media hashtag "#BetterOffNow" and the website betteroffnow.gop focuses on accomplishments made by Republicans since they've held the majority in the House of Representatives. Better Off Now cites the current low unemployment rate, increased take-home pay, moves made in the fight against opioids, and improvements made to the military. House Republican Conference Chair Rep. Cathy McMorris Rodgers (R., Wash.) spoke to how the economy has improved since Republicans took control of the House. "For the last decade, we have been asking ‘where are the jobs?’ Today, it’s an entirely different story. In 2010, the unemployment rate was at 9.9 percent. Just last month, it was at 4 percent. We are celebrating that 4 percent," McMorris Rodgers said. "More people are coming off the sidelines and into the workforce, companies are coming home, and 3.7 million jobs have been created since President Trump was elected." "This is the comeback story that was made possible through the Better Way agenda, the foundation that was laid two years ago. And we’ve worked hard to deliver on those results," McMorris Rodgers said. "Today, Americans are Better Off Now." Rep. Warren Davidson (R., Ohio) mentioned how Republican policies are positively affecting America's national defense. "What’s important is that Republicans are delivering on our promises," Davidson said. "As a result, America is stronger at home and abroad, with a booming economy, safer communities, and a revived military." Republicans will defend their majority in both the House and the Senate during the 2018 elections. This entry was posted in Politics and tagged 2018 Election, Cathy McMorris Rodgers, House of Representatives, Republican Party, Republicans. Bookmark the permalink.